90 Degree Office Concepts puts in the time to make your office design exceptional. 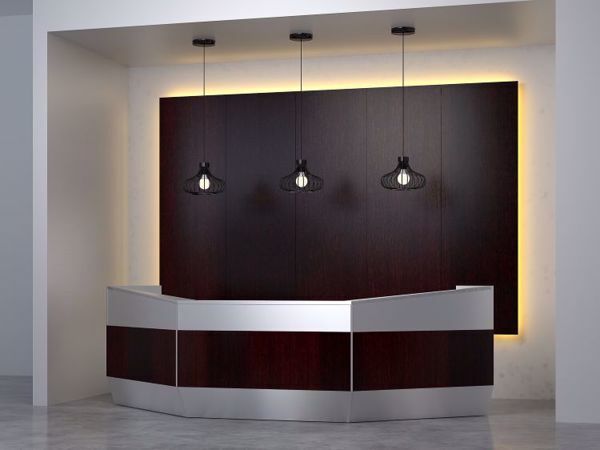 The Portland Modern Reception Desk was created to give your office reception area a visual impact second to none. It was designed to give you all the design and functional elements of a U-shaped modern reception desk with more useable interior workspace and greater privacy. The Portland desk end panels rise to 48"H and slope downward toward the center of the desk. The center section provides a transaction area for visitor document exchange, and is shown at 42"H. The basic desk is designed in three sections, and each section can be adjusted to the size that works best for your space and function. The base portion of each section is positioned inward, for esthetics and reduced shoe contact. The entry-level size per section for the Portland is 36". Materials for this modern reception desk begin with HPL and can be upgraded to suit your preferences. The Portland includes a three-part work surface to align with the exterior sections. Each work surface measures 24"D, and features grommets on each extremity of your reception desk. The Portland desks shown above offer ideas in maple wood veneer, finished in backwood. The accent material surrounding the wood veneer is brushed aluminum, and it is incorporated into the transaction top, as well. This reception desk has a 60"W center section and two flanking 48"W sections.